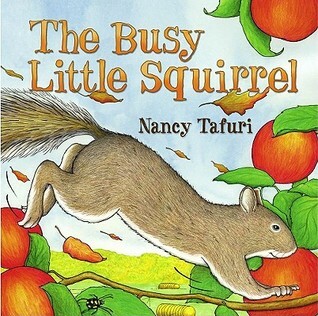 Book: Busy Little Squirrel by Nancy Tafuri (Simon & Schuster, 2007). Here's a little STEM connection for you: as I read this book, we talked about what squirrels do to get ready for winter and we identified the different foods that squirrel collected and stored. 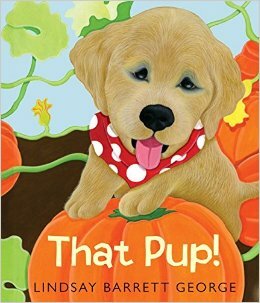 Book: That Pup! by Lindsay Barrett George (Greenwillow, 2011). This book is a natural follow-up to Busy Little Squirrel as a puppy runs around digging up acorns that he keeps finding in his yard. At the end, he realizes that the squirrel hid them on purpose and he helps put them back. 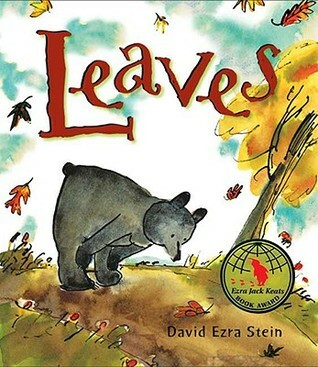 Book: Leaves by David Ezra Stein (GP Putnam's Sons, 2007). Poor bear panics when the leaves start to fall off the trees because he doesn't realize that they will be coming back in spring time. This is a great book to talk about seasons. Felt: Fall is Not Easy (based on the book by Marty Kelley). This is one of my very favorite felt stories and fall storytime books because it always gets the kids and parents laughing! Book/Felt Activity: We're Going on a Leaf Hunt by Steve Metzger (Cartwheel Books, 2005). I passed out felt leaves in different colors and as we read the book, I had kids bring up their leaves when we got to their color (i.e. red maple leaves, yellow birch leaves, etc.). 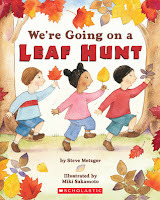 Leaf exploration - Fall is a GREAT time to bring in some leaves and explore them. Since we were still pretty early in the fall, I had mostly green leaves for the kids to explore, but they still loved looking at different shapes and examining them under magnifying glasses. Leaf rubbings - This is a little hard for preschoolers to do, but with help from parents (which we had in this storytime), it went pretty well.